The detailed association and arrangement of structures in a fault zone are a record of the physics and the mechanisms that govern fault behavior. 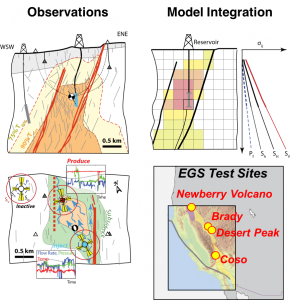 Exhumed fault and fracture networks provide the critical observations to develop and test the mechanic that explain the behavior of the brittle earth. To test basic concepts of how individual structures are related, interact, and combine into a system driven by the stresses in the earth requires a mechanical framework. Computer simulations enforce mechanical rules to explore and test the relationships evident in the field or in boreholes. The brittle crust extends to many kilometers depths. Essential mechanics governing faults, earthquakes, and reservoir systems occur at depths only accessible through boreholes. Using boreholes we can observe fractures and faults and the stress states imposed on them.